First, AIG - the huge insurer just blew a massive tire, announcing a $8 billion writeoff - and another capital raise, which again dilutes current shareholders and means earnings PER share is going to be punished for years to come. But really it's all good - whats $8 billion among friends - and it's all priced in (oops, not so much, down 8% after hours, but maybe by tomorrow morning after CNBC announces it's a good thing it will be up). What I want you to do now is close your eyes and imagine Uncle Ben B as a short order cook. He is now ringing that bell over his head and shouting over to the other minion cooks - "got a fresh order, let's get up some more billions of US pesos pronto, print 'er up!" More paper currency coming folks! Faaaaantastic. (AIG) reported after Thursday's closing bell that it lost $7.81 billion in its first quarter due to heavy writedowns on credit-default swaps and mortgage-related investments. The insurance giant became the latest in a long string of major U.S. financial institutions to shore up its financial position by raising about $12.5 billion fresh capital through a common stock offering and an equity-linked offering. I read an excellent blurb of what is going on in our "innovative, most stable" financial system in the world. I am going to copy it word for word, because it is in fact the reality... while we point our fingers at those "evil oil men" which is a good distraction from what is helping to accelerate all our inflation. The strategy employed by these banks seems - to slowly release controlled amounts of write-offs each quarter while creatively managing (and hiding) their true losses by borrowing and repaying, borrowing and repaying, borrowing and repaying using the Fed's made up money. This will slowly bleed them all down to correct levels of value and liquidity and avoid panic. Meanwhile, stockholders and taxpayers bear the load until we can get through this... maybe in a few years, yes? Bingo... could not of summarized it better myself. But on to other items; I have to admit this Priceline (PCLN) has intrigued me for a few quarters but I can never pull the trigger. 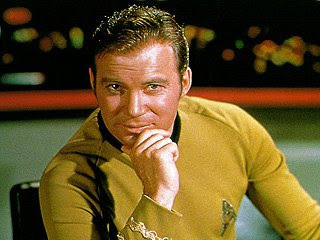 I mean who does not love William Shatner? They just continue to hit home run after home run. (Booooyah (tm)! beat by $0.16) My thinking has been as the pooring of America continues, Priceline has a bit of unique niche with their model and could sort of be the Walmart of travel booking... they sure seem to be feeling no ill effects from the economy, so this may be what is happening. Online travel company Priceline.com Inc. said Thursday it swung to a first-quarter profit, as gross travel bookings and international revenue surged. Adjusted net income, which excludes one-time gains and charges, rose to $37.3 million, or 76 cents per share, from $17.4 million, or 43 cents per share, in the year-ago period. Total revenue rose 34 percent to $403.2 million from $301.4 million in the 2007 quarter. The results beat Wall Street predictions. Analysts polled by Thomson Financial expected a profit of 60 cents per share on $377.2 million in revenue. Priceline.com said it expects to post a 2008 pro forma profit of $5.25 to $5.65 per share, while analysts polled by Thomson Financial expect a profit of $5.11 per share. Priceline.com added that it expects to generate about $7.5 billion to $7.9 billion in gross travel bookings for the year. Definitely secular growth here, and definitely not related to commodities so it would be a nice complement to our typical holdings... not cheap though - it's going to be trading at just under 30x forward earnings when it opens tomorrow.